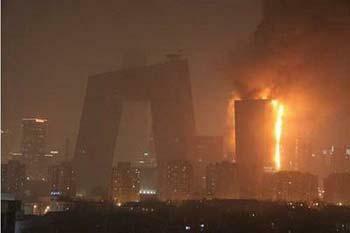 After hours of firefighting, emergency crews have finally quenched a fire that raged in a subsidiary building in the new China Central Television complex. The building was to have housed the luxury Mandarin Oriental Hotel. Local authorities say the fire started at about 8: 25 pm on Monday, and razed more than 100,000 square meters. Seven people including six firefighters suffered from smoke inhalation and were rushed to a nearby hospital for treatment. A spokesman for the Beijing Municipal government says initial investigations showed the fire had been caused by illegal launch of fireworks. Firefighters found remnants of fireworks on the southern roof of the burning building.